HARVEST. It’s one of our favorite times of the year! 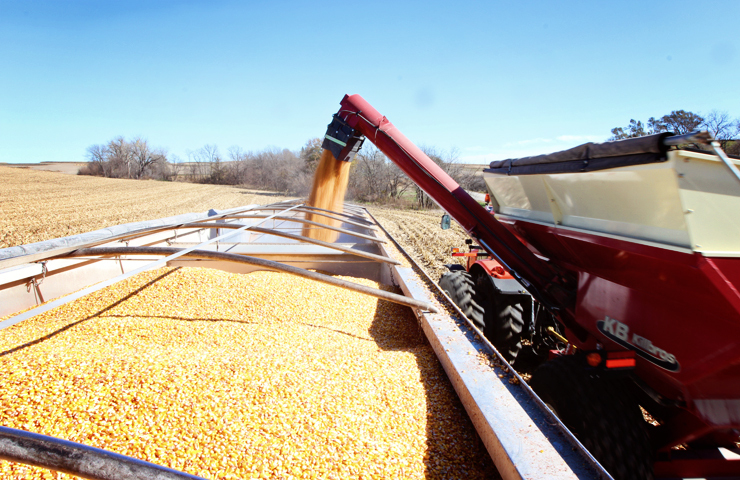 As a farmer you get to haul in the crop that you have been caring for all year-long. You get to see what your yields are and how the weather affected them. 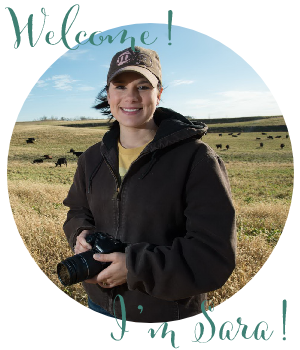 You finally start getting paid again (Farmers don’t get weekly, semi-weekly, or even monthly paychecks! We get paid when we sell the grain to the elevators or when we sell cattle. That’s pretty much it! Talk about having to do some major planning!) And you’re trying to get harvest done before the holidays start so you can enjoy them with your family. 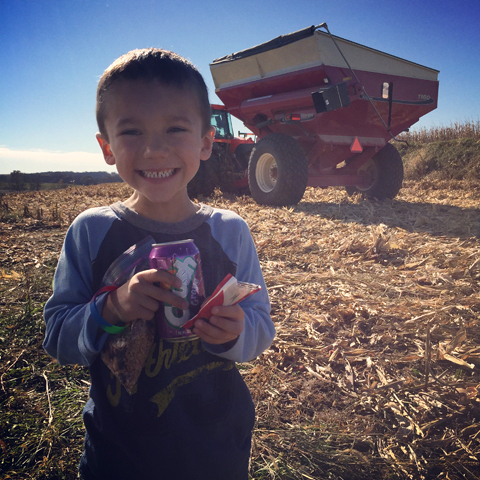 This is Kevin’s 16th harvest that he’s done on his dad’s family farm and I think 14th on his mom’s family farm. 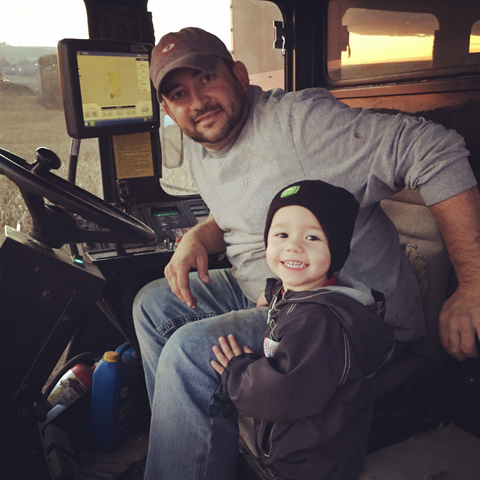 He had the opportunity to begin farming while in college, so he’s been farming almost half his life! When he was little he used to ride with his grandpas just like our sons are doing with him. This whole week Hudson went to Pre-School in the morning and then came home and harvested with Kevin in the afternoons. If you follow me on Instagram, some of these photos will look familiar! 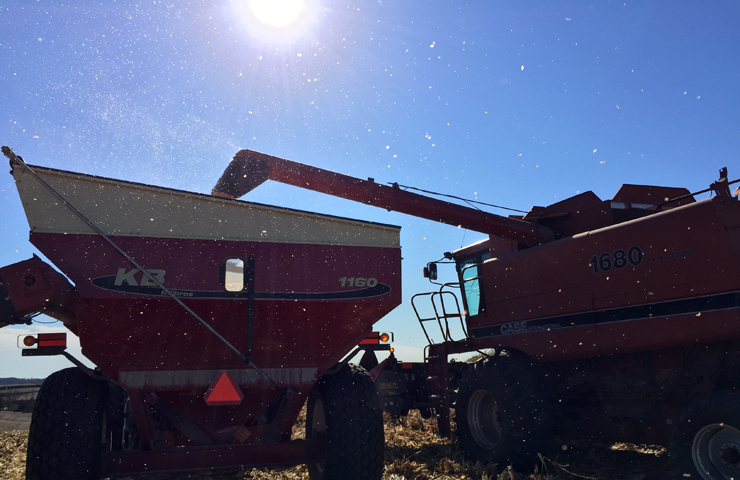 During harvest, the combine picks the corn or soybeans and then transfers it to a grain cart that is pulled by a tractor like the one above. The tractor then carries the grain down to either the grain bin for storage or to the waiting semi which will haul it directly to town to the grain elevator where we sell it. One evening this week Kevin asked me to bring Axten over to him after I was done with work so he could ride for a while. 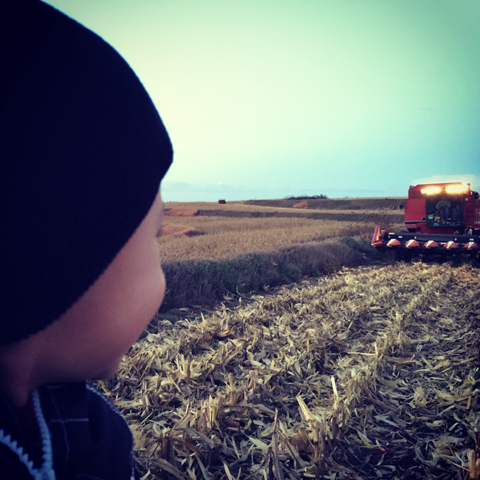 I just love watching the excitement on the boys’ faces when they are watching their daddy or when they get up in the combine or tractor for a ride. Axten had the biggest smile on his face while were waiting for daddy to come pick him up in the field. His favorite word right now is “bomb bine”. That’s his almost-two-year-old version of combine. And they are all over the place right now, so driving down the road he’s yelling “bomb bine” and pointing them all out! I took this picture below the other day when I brought Kevin a sandwich for lunch. The corn chaff made for a pretty picture, but I ended up with it all over me! 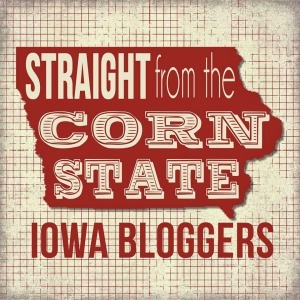 Corn chaff is just the dry flaky casing of the corn. When unloading it tends to float around and look like it’s snowing if the sun is hitting it just right. Kind of feels like you’re in a big snow globe! 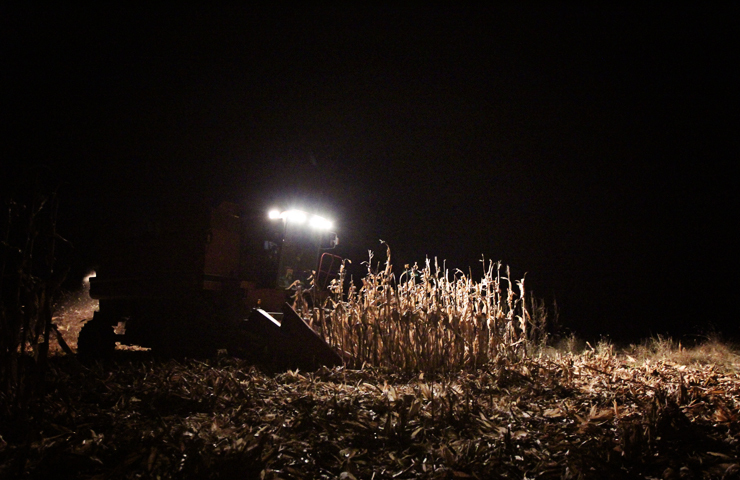 If the weather is cooperating, Kevin will keep harvesting even after nightfall. 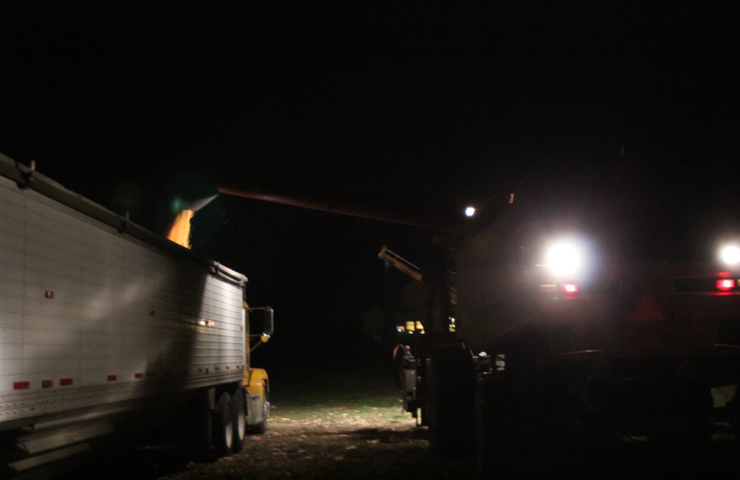 This picture was taken about 7pm when we brought dinner to him one night this week, but he’s been harvesting late into the night and starting really early in the morning. We had a good week this week, weather-wise, but next week could be a different story! The temps are going to drop starting today and the weather lady even mentioned that four letter word- SNOW! As much as I love snow, I wouldn’t mind if it held off just a little bit longer so all the farmers could have another good week or two of harvest. But you know Mother Nature, she never seems to cooperate! Stay tuned to see how harvest wraps up this year! Hoping to be able to be all wrapped up with it before Thanksgiving, even with our late start, but we’ll just have to wait and see! Have a great weekend!